There you go, that's the Beard that made Newport famous. 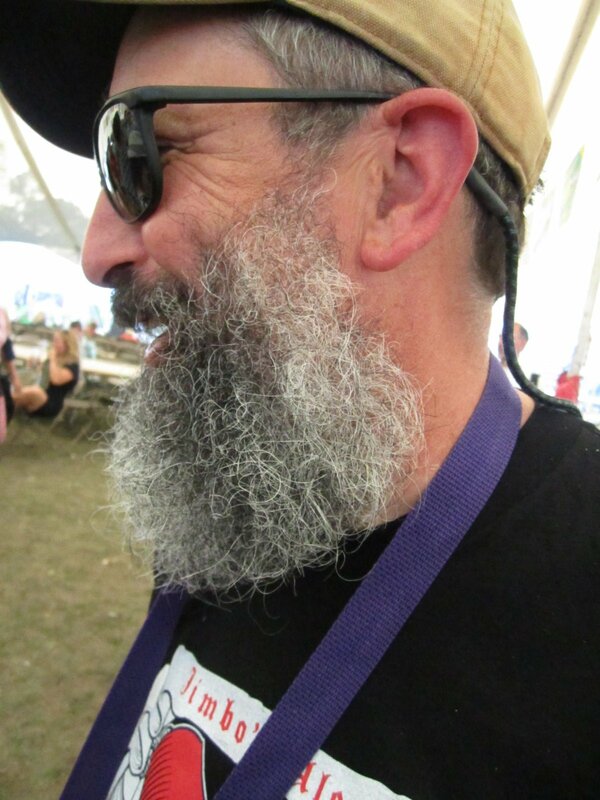 Rogue's Beard Beer is something you should plunk down a dollar for at the 2013 Oregon Brewers Festival, not because it's good, but so that for the rest of your life you can tell people you drank beer made from some guy's beard. It reminds me a little of a bread-yeast homebrew someone gave me a few years ago. Much has been made of the change in glassware this year. Happily, it's glass for the first time, instead of plastic. However, the glass only holds 12 ounces as opposed to 14 in years past, and the sample size has gone from 4 ounces down to 3. There was a lot of hand-wringing before the festival about that small sample, but honestly it was big enough for me to get a good idea of the beer. The one thing I will say is, given the small size, the pourers could at least make sure they get your pour to the line. Apparently they've been trained to err on the side of smaller pours, and about half the time I had to ask for a top-up. Come on, guys, if the liquid is half a finger over the line, it's not going to break the bank. I'll try to update with more picks and possibly some pans after my foray today. Meanwhile, NO WOO-OOO-OOO-ing! How about that Trailer 5, eh? You could just camp out in front of it and almost feel complete. It did seem like the center of the universe. And I like the extra lawn space this year.